It’s poooouuuurrrrrinnnggg! I love it. I love listening to rain as I read, or write, or draw, or rearrange my collection of hand-painted Royal Doulton porcelain clowns. It’s the perfect soundtrack for quiet activity. Or no activity at all. After a week of really hot weather, I’m once again in my hoody, drinking a hot beverage, and appreciating the heck out of this big ol’ drink of water falling on our droughty city. I kept my walk fairly short today, only about 45 minutes. The skies were rather moody. 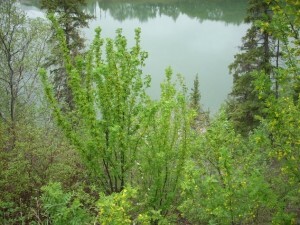 But…didn’t get rained on, and I’m happy to report I stole my first bouquet of lilacs today. It’s kinda, sorta a public area, but what’s a girl to do? I don’t have a lilac bush…or is that a tree? Not sure. I don’t have a green thing that sprouts purple things in the spring, therefore I have no choice but to steal other people’s purple things. Hmmm…no chocolate. That’s a problem, but I’ll take the storm. This particular route follows the south side of the river all the way from the University to Skunk Hollow, otherwise known as Lavigne Road. 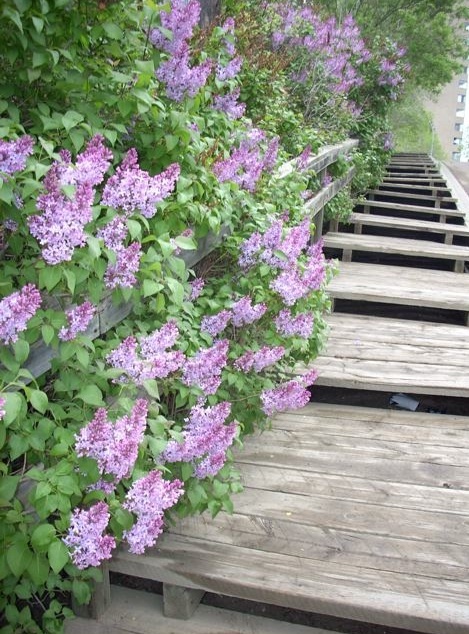 It’s a steep drop from Saskatchewan Drive, and it’s lined by three-story houses and …uh…public lilac bushes (or trees.) When I first started walking more than a decade ago, I relied on this route to get me home. It links to downtown and many other paths, and it’s quite lovely. Almost every time I walk this path I see Dennis Hopper circa Easy Rider, biking through the woods. Except it’s not Dennis Hopper, it’s some middle-aged guy in a fringed jacket and leather hat riding his tricked-out mustang bicycle. Born to be Wild in south Edmonton. I rarely take the Skunk Hollow route now, simply because I’ve discovered other, longer paths, but the thought crossed my mind today that if the area south of Louise McKinney Park becomes inaccessible due to that fu%$#! LRT extension, I will be taking this path more often. Way more often. As far as my weekday excursions into the river valley are concerned, the proposed LRT construction is going to be the equivalent of an axe. At least I have my hand-painted Royal Doulton porcelain clowns, and the rain. 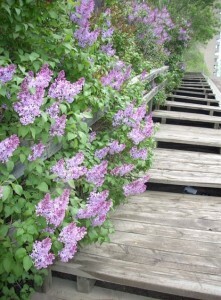 And the contraband lilacs.